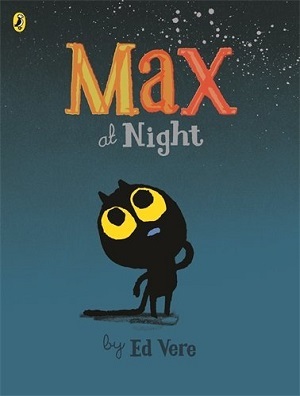 One of my favourite children’s illustrators, Ed Vere published Max the Brave in 2014. The story of a small kitten who is brave, if a little lacking in knowledge, was a huge success. Max at Night revisits Max, with nods to childhood favourite ‘Goodnight, Moon’, but with a sparkling twinkle of modernity in attitude and text. Vere is part of a cohort of modern children’s illustrators who opt for minimalism and yet succeed in making their characters both extraordinarily empathetic and expressive. Max at Night is Max’s search for the moon so that he can say goodnight to it before he goes to bed. Anyone with young children will recognise the stalling of bedtime, with just one more task to be completed before bed – be it one drink, another story, or finding a toy. In Max’s case he needs to find the moon to say goodnight – and being the brave kitten that he is, will go to extreme effort to do so. The colour palate of this latest picture book works well. There is a dark tone throughout the book, nodding to nighttime, with Max’s huge yellow eyes standing out against the background. The night sky shifts from a beautiful red to dark tones of blue and purple and nearly black, with the lovely orange and yellow of the inside of the house. Max’s huge eyes are adorable, the stark yellow – in contrast to the background of ‘night’ in all its forms- in shades of blue and red. “Now you tell me!”, when the moon explains he can hear Max from his bed, is both funny, and pitch perfect because it is the type of dialogue a youngster would pick up from his parent. There is wit apparent in the illustrations too as Max climbs “gracefully” over the sleeping dog. Very attractive, very witty, very wise. A successful sequel. You can buy it here. Another storming success in 2014 was Steve Antony’s The Queen’s Hat. 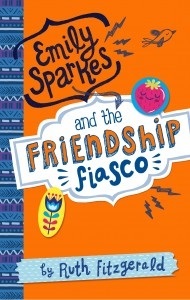 Steve’s debut was shortlisted for the Waterstone’s Children’s Book Prize and has become a fine staple in any children’s library. The children in my library have an enormous soft spot for Please Mr Panda, which is in constant demand. 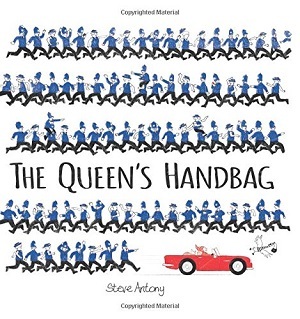 However, this sequel about the Queen and her handbag will be a hot contender. The Queen’s Hat looked at the London landmarks. The Queen’s Handbag features landmarks around the United Kingdom in trademark red, white and blue colours. When a swan steals her handbag from her arm, the Queen chases round the country looking for it, accompanied this time by blue policemen and policewomen rather than red guards. In a similar vein, Antony has gone to town on the detail, with swarms of the police, each with different apparel and expression. The Queen’s modes of transport are spectacularly funny and enjoyable, from her red convertible, to her red motorbike, followed by the red arrows, her extraordinary bicycle, speedboat, train and horse. There’s even a union jack parachute – James Bond watch out. Neat touches abound – from the policemen and women taking selfies on Snowdonia, to the policeman paddling his feet off the Giant’s Causeway, to the self-referential Mr Panda running in the London marathon. See if you can spot the policeman whose union jack boxer shorts are revealed when he loses his trousers! There is so much to look at on each spread, and as one fellow reviewer said about The Queen’s Hat – it’d be a delight to have one of these pictures as a piece of artwork hanging on the wall. I’d like the London skyline – a muted pencil drawn backdrop behind the lamppost – as if London was drenched in a beautiful purple evening mist with a single lamppost standing out in the foreground. Even the last page has a funny last line, and of course the endpapers are to be marvelled at. Rows and rows of policemen and women (plus a couple of other things dotted around too). A hugely successful sequel. Steve Antony’s website has a fun activity with 20 Things to Spot in the book. Visit it here., and buy the book here. Lastly, a quick mention to One Thing by Lauren Child. A new Charlie and Lola book for those that follow them, this reviewer actually thought it was the best yet. The voices and thoughts of Lola and Charlie seem more authentic, more drawn from real life. The premise is well thought out. 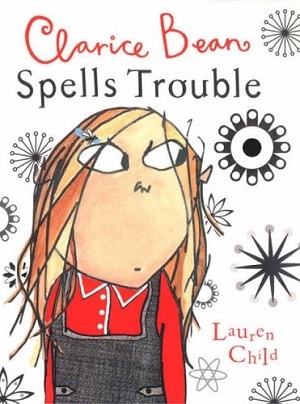 Lauren Child introduces numbers and the concept of time to Lola and her readers. 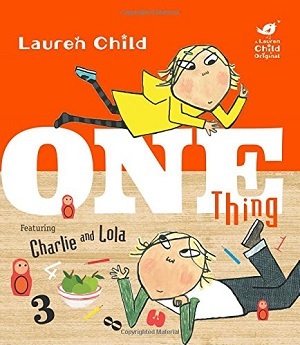 Charlie and Lola take a trip to the shops to buy just one thing – Charlie has to question his Mum to see if it’s one thing each, or one thing shared. Then there is basic addition as Charlie and Lola add up how many minutes it takes to get ready, as well as counting the animals they encounter on the way to the shops. The cleverness lies in Lauren Child’s dismemberment of the concept of time. Lola has to do something before she leaves – saying she will be “half of a second”, and Mum says they are “leaving in one minute”, neither of which turns out to be correct of course, as these are common phrases rather than accurate times. Child also wittily includes Lola’s bargaining with her mother and with Charlie, firstly over the number of things she can buy – compromising on one – and secondly over sharing Charlie’s badges with him – again settling for one. Sums and numbers fall from the pages in an enticing way, the concept of time and numbers are wonderfully extrapolated. It goes on a little too long for my liking, but overall a great addition to the Charlie and Lola collection. Buy it here. My books and myself? My books and I? Are you finding this difficult to read? And now I’ve started a sentence with ‘and’, which is okay in literary prose isn’t it? Although children are taught that you absolutely mustn’t start a sentence with ‘and’; it’s not deemed to be an acceptable sentence opener. Seriously though, how much does it bother you? I read a LOT of books. Or a great many books! So many of them contain grammatical errors, particularly when I read them on the kindle, although admittedly many of the ebook errors are typos, which leaves me wondering if the digitisation was just a tad slapdash. Are we making more grammatical errors because our language is evolving and we deem it to be okay to finish a sentence with a preposition, split an infinitive, or use that instead of which, or are we just not taught grammar correctly anymore? Are there less copyeditors (yes, I know it’s fewer) with a good grammatical grounding? Narrative voice should also make a difference. If we can’t excuse David Baddiel for the writing above, would we be more willing to excuse it if he had written the book in the first person instead of the third person? The Adventures of Huckleberry Finn by Mark Twain is acceptable because it’s written in a colloquial way in the narrative first person. However, The Adventures of Huckleberry Finn is as much about accent and social commentary as it is about grammar. Do we always need to be grammatically incorrect to talk in a child’s voice? The following books all use grammar incorrectly for effect – to create the child’s personality and they’re all in the first person. Are the grammar mistakes immediately apparent to the average child? “When I ask Mum why he’s so cheerful, she says, “He’s just got himself this weekend job at Eggplant and it has really put him in a good mood.” To me, this still sounds like Clarice Bean – or is Clarice not quoting her mother directly, but twisting it from her memory into ‘Clarice speak’. Is bad grammar excused if it’s in speech marks because it’s representative of how we speak, which is often grammatically different from written prose? Diary of a Wimpy Kid by Jeff Kinney is American, and so of course a reader should expect Americanisms, but the author also deploys a lack of good grammar for effect – it is a child’s diary after all. However, if it’s being an ‘authentic’ kid’s diary – would the spelling all be correct, or should the editor be modifying that too to create ‘personality’? Tricky one, hey? What about apostrophes? They all seem to be correct in the Wimpy Kid books…should they not be? Do your children speak like this? Can readers/writers get inside the head of a youngster without resorting to bad grammar? I have a child in my house who insists on saying “Me and my friend went swimming” instead of “My friend and I went swimming”. I correct her constantly, which must be ‘super irritating’! However, did she pick this up from reading, or from her other friends? One children’s book, which I read recently, made this one error all the way through, even though the rest of the book was grammatically correct. For effect or just an error? Has our language changed so much from the days of Johanna Spyri that it’s now acceptable for modern literature to have bad grammar littered throughout? Does the expanse of bad grammar in our midst mean that children’s authors have a responsibility to write with even more care for correct grammatical usage to teach our children what’s right in the first place? If our children pick up their language tools from reading, at what point do we think its okay to break the rules for effect? And one day will they even know the difference? When does bad grammar become a literary style? By the way, last Thursday I guest-blogged on another site, MG Strikes Back, about the role of animals in middle grade fiction. You can read it here. It mentions some of my recent favourite MG books too. This December it’s not quite cold enough for snow, and set to get warmer by the day in London this week. However, for me, the magic of Christmas is still tied to a snowy landscape. There is something special about snow. No other weather creates such a magical environment for a young child. In recent years in London we’ve had on average one ‘snow day’ a year, in which the schools close and it’s free play outside all day. 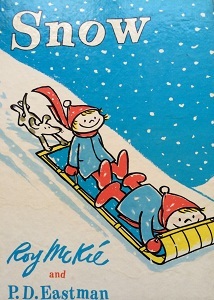 One book from my childhood readily sums up the delight of this day, Snow by Roy McKie and P.D. Eastman. Published in the US as part of the Dr Seuss beginners’ series to learn to read, the basic text and smile-inducing illustrations capture the excitement in a nutshell. More recent offerings also manage to convey the happiness of a snow day, and the inevitable melting. Snow is My Favourite and My Best by Lauren Child in the Charlie and Lola book series manages to express the impatience of a child in wanting to go and play immediately before it all goes away. The tradition of my children having hot chocolate after coming in from a snow day was heavily influenced by this book! There are some important lessons here though, encouraging children to think about how to make something special. Is snow so special because it doesn’t happen every day? Both of these manage to convey the fleetingness of snow. My new favourite is Snow by Sam Usher. From the front cover, it’s already apparent that Sam can conjure an atmosphere with a few simple pen lines. In no other picture book is the tempting flat whiteness of unspoilt snow so cleverly drawn. That impatience to go out, seen earlier in Charlie and Lola, is beautifully manifested in the slapdash hurry to get dressed, brush teeth and tie shoes…all commonly hurried activities in the impatient young. Then a breathtaking spread of pure white in front of the reader, as the snow is in front of the child. However, the book doesn’t let us leap into the snow, because, like the boy in the story we have to wait for his grandpa to be ready and take him – and then when they finally go, after the agony of watching everyone and everything else trample the fresh snow – there’s a great surprise in store. Set to be a children’s classic – I can’t wait for Sam’s next book. From new to old – Snow Bears by Martin Waddell is a simple tale of a mother bear who pretends not to know where her baby bears are because they are all covered in snow and so look different. They play games in the snow, until the little one says its cold and they all go home. For me it’s the page where they return home to eat their toast that really makes me want to hug this book! Sarah Fox Davies’ illustration of the bears illuminated in the warm glow spilling out from the wooden hut sums up that wonderful feeling you only get by going into the warmth after getting cold and wet and breathless in snowy activities. The new pop up version was published in September this year. Snow Day by Richard Curtis is another addition to the snow canon of picture books. I was very excited about this as it is illustrated by Rebecca Cobb, one of my favourite stars in the world of children’s illustration. The pictures certainly didn’t let me down, especially the army of snowmen, and the empty classroom. The premise is that there is a ‘snow day’ but the worst schoolboy and the strictest teacher don’t get the message (despite the emails and phone calls) and turn up to school. What could be a miserable day turns into a day of lessons in the snow, and by the end they seem to be good friends. This is definitely a picture book for slightly older children, the length of the book and references to structured lessons ensure this. My last new book for this Christmas with snowy landscapes is Snow by Walter de la Mare, illustrated by Carolina Rabei. This is a beautiful picture book – the illustrations create a nostalgia for Christmases in peaceful sleepy snowy villages, with happy excited children and a natural landscape of trees and robin red-breasts with no cars or modern city references to spoil the footprints in the snow. The colour adds to the picture perfectness of the book – muted browns and beiges, with splashes of true red for hats and curtains and presents, which bring to life the characters within. The picture of Father Christmas on his sleigh speeding through the swirling snow against a black backdrop sky is truly stunning. However, I can’t help but think that the wonder of the illustrations detracts from the beauty of the poetic words themselves – reading it in isolation conjures more of the magic than read piecemeal sentence by sentence across a book, but if it brings the magic of a great poet into the lives of children I can’t quibble. One final mention for a book that is not strictly about snow, but contains a story in a snowy landscape. If you want a bit of glitter on your snow, this is the one for you. (tip: read under electric light). Little Honey Bear and the Smiley Moon by Gillian Lobel, illustrated by Tim Warnes is a common enough tale of friendship – Little Honey Bear sets out to reach the moon with two of his friends, gets lost in the dark, and is finally found by Mummy Bear. However, I love this book for the liberal use of glitter to highlight the illustrations on each page – it brings the magic home for Christmas. Dyslexia Action quotes that on average one in three children in every classroom is dyslexic and therefore struggle in some way with literacy. [i] As a reading for pleasure consultant, it’s vital to help parents find those texts that will appeal to a dyslexic child, and keep them reading because they want to. In particular, it’s important not to make that child feel as if they can read only ‘easy’ books that their peers read long ago, and for which they might be ridiculed for reading. 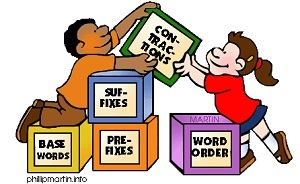 Being dyslexic only means that the processing channels can get mixed up – it doesn’t mean the child is in any way less intelligent, and so the books still need to be content appropriate. It’s also vital that the child doesn’t find the processing too difficult, so that their confidence (which can be the first thing to go) is nurtured, and it’s vital to help them discover that reading can be a pleasure not a struggle. Luckily, in today’s publishing industry, the publisher Barrington Stoke is doing some excellent work producing books that are dyslexia-friendly, and seek to be like any other chapter books in their outward appearance. paper that’s off-white to reduce glare, well-spaced text, thick paper so that the words from the next or previous page do not show through, wide margins, straightforward syntax, (which means that there aren’t too many clauses in one sentence), an unjustified right-hand margin, a well-structured story, and signposts that clearly show the story’s natural pauses – pictures, headings etc. A funny book about a guest who doesn’t want to leave! Part of the 4u2read series from Barrington Stoke, which also includes excellent stories by the likes of Annie Dalton, Michael Morpurgo, Jeremy Strong, Malorie Blackman, and Terry Deary, all aimed at an 8-12 years interest age. One of my favourite authors ever since reading Inkheart, Cornelia has the ability to create magic through simple text. When Matt gets bitten on the way home from the cinema, he realises he’s been infected by a werewolf. Can he undo the curse before the full moon? See also The Moonshine Dragon by Cornelia Funke for younger readers. Another excellent children’s author best known for her picture books (many are surprised that Julia Donaldson has so many titles for older readers, but she does! ), this is a simple tale of a home for pets and the trouble that ensues when Doris the snake comes to stay. 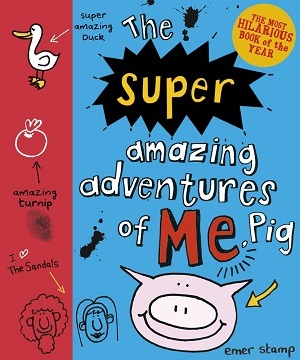 Part of the Little Gems series, this is aimed at the 5-8 years age group, which is quite a wide range in my opinion, but excellent for confidence building for first readers. When Hannah moves to a new school she needs to discover who are her real friends. A good story about fitting in and friendships. Jean Ure is a well-established writer and many of her books feature girls aged between 10-14 years, so a young reader can progress through her books if she likes the style. I personally remember Jean Ure for her now out-of-print titles such as One Green Leaf and A Twist in Time, and Hi there, Supermouse! which I adored! A fabulously funny story about unconventional neighbours. Mrs Weird is a stuntwoman and Mr Weird a mad scientist and they have some unconventional habits, so moving in next door to the Primms is bound to spell trouble. There are many more titles on the Barrington Stoke website, to which I highly recommend a visit. However, I would also point to stories such as the Horrid Henry series by Francesca Simon as a good read for dyslexic readers because they contain brilliant illustrations by Tony Ross, and are divided into short manageable chapters. Likewise Clarice Bean Don’t Look Now by Lauren Child and the Ottoline books by Chris Riddell are all stories broken up into short chunks with fantastic illustrations to accompany the text. Mr Gum by Andy Stanton has excellent spacing too, and try the Agatha Parrot books by Kjartan Poskitt, which, like the Mr Gum series, are also illustrated by the amazing David Tazzyman. I would recommend the Edge series of graphic novels from the publisher Franklin Watts, which are also published on dyslexic-friendly paper. They are an excellent publisher of non-fiction titles, and their Slipstream series of reading resources is aimed at struggling readers. For older readers (young teen) the Wired Up series by the publisher A&C Black are an invaluable source of gripping reads at manageable lengths and levels. Percy Jackson and The Lightning Thief is the first of a hugely popular series of adventures by Rick Riordan. This series focuses on adventures with the Greek gods, and the books are tremendously exciting and fast-paced. Aged 9 and up. (and there’s a film). The Hank Zipzer series of books by Henry Winkler (yes the Fonz to you) follows the haphazard adventures of a ten year old boy. Very American but also very funny. A lovely story about a football mad boy who is great at football but struggles to read. Part of the Football Academy series. Tom Palmer is also published by Barrington Stoke. I also want to champion Sally Gardner here, who herself is dyslexic and has spoken out about this many times. 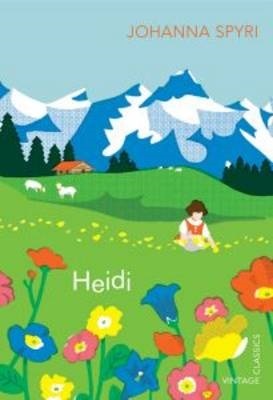 She has written much for younger readers, including the Magical Children series, and gives splendid advice such as not shying away from giving dyslexic children a different platform from which to read. Giving a dyslexic child an ereader or a tablet for reading can help build confidence as it masks what they are actually reading – and therefore reduces any peer pressure. Some readers also find the letters jump around less on the ereader, and of course you can play with the font size. You can also try an audio book alongside the printed word for more challenging titles. And never, never underestimate the joy of reading aloud to your child (whatever age) to encourage their love for reading. [i] Dyslexia Action (2012) Dyslexia still matters.